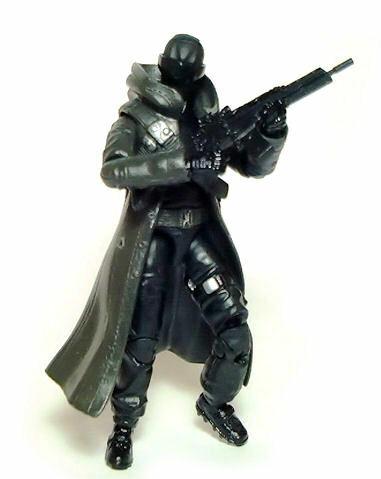 Hasbro released the Snake Eyes (Paris Pursuit) figure in 2009 as part of the second wave of figures from the G.I. Joe: The Rise of Cobra line, based on the appearance of the character in the motion picture of the same name. This is particular outfit was used like, for 25 seconds in the movie, but it is cool enough to merit a whole figure in my opinion. 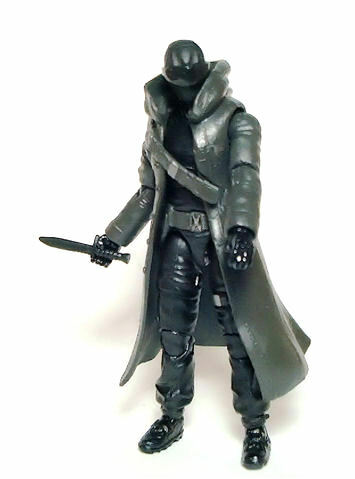 Basically, what we get is Snake Eyes wearing a trench coat over his regular commando attire. Underneath the trench coat the outfit is rather generic, with no single element standing out for any reason. It is however, well detailed and no doubt the pieces will serve as the basis for many a future figure. A welcome change from the first series movie Snake Eyes is that this version doesn’t have the sculpted lips, although it does share the same visor piece. This is molded out of translucent smoky plastic and plugs onto the sides of the head. If the light hits it right, it is possible to note the grill pattern on the inner surface of the visor, which is a neat touch. The trench coat itself is nicely sculpted with folds and creases where appropriate and further detailing in the form of stitch lines and patches along with arms and torso. The trench coat has a hood sculpted drawn back and an integrated bandolier closes the garment at the front. The material the trench coat is made of is surprisingly rigid, almost as resilient as the arms themselves, although the piece is flexible enough to allow removal from the figure. • Ball jointed neck. Pretty much free rotation and a decent amount of tilt all around. • Peg & hinge shoulders. Excellent motion range on both shoulders. • Peg & hinge elbows. Bending range is slightly above 90° with free 360° sideways rotation on both arms. • Swivel wrists. Free swiveling range for both hands. • Ball mounted torso. Free 360° swivel and decent tilting back/forth and sideways, but with the trench coat on it serves pretty much as a simple swivel joint. • Ball jointed hips. Pretty good motion range all around. Again, due to the trench coat no sitting poses are possible. • Double hinged knees. These bend way beyond 90° and are quite well hidden from view, although their usefulness is also affected by the coat. • Peg & hinge ankles. Good range of motion back and forth and free 360° swivel. The figure comes molded pretty much in the correct colors, dark gray for the arms and trench coat piece, and black plastic for pretty much everything else. However, there are still a number of paint applications going on that enhance the overall look of the figure, like black gloss paint for boots and gloves and small silver applications for clasps and the G.I. Joe crest on his chest. All of these paint operation seem flawless, with very little variations from sample to sample. 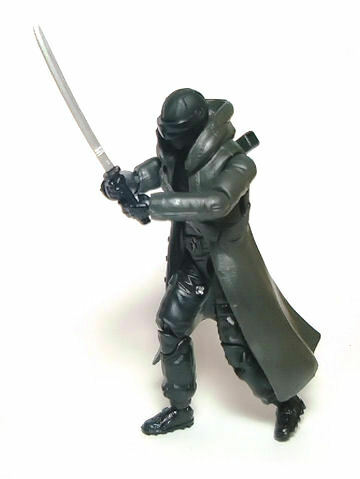 Unlike the other figures in the line, this version of Snake Eyes doesn’t come with a giant spring-loaded launcher. 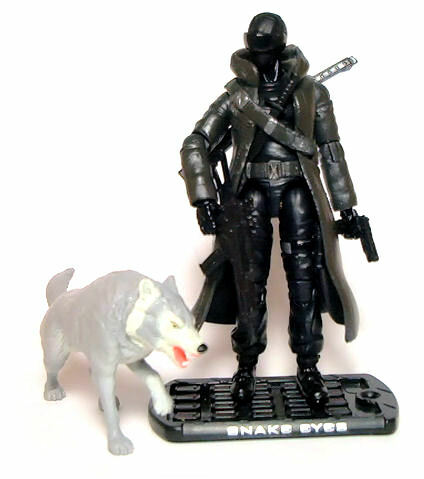 Instead, Snake Eyes Paris Pursuit comes with his pet wolf Timber (whom did not appear in the movie, by the way) and a nice selection of accessories: MG36 machine gun, Colt pistol, BAR knife, Katana sword w/sheath and a display base. 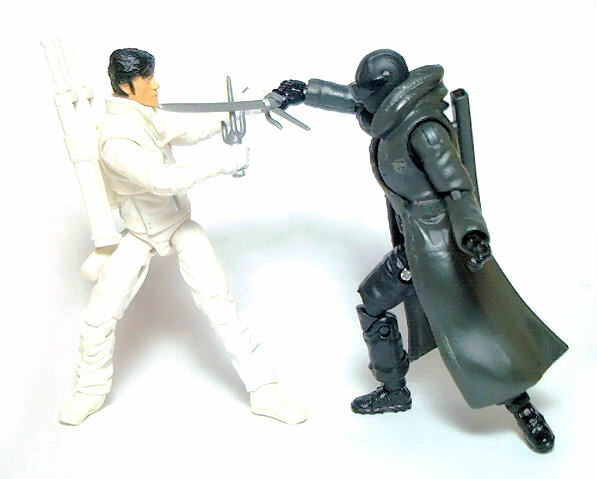 Except for the katana (which has a silver painted blade) and the sheath (made from the same gray plastic as the coat), pretty much everything else is molded in black plastic. Timber however, comes either molded in light gray or black plastic, depending on which production batch you get. At the time I do not know which is the rarest of both versions, but on either one the paint applications are the same. Snake Eyes (Paris Pursuit) is arguably among the coolest figures from the movie line, even if it lacks the poseability of the wave 1 figure, but it succeeds in providing a refreshing new look for the character without resorting to environment-specific attire. I looked at this figure in the store. I’m just not sure on the hood. Having it half up gives a unique look. He had the hood fully up in the film, which was an interesting look as well. That’s the version I think I’d have rather seen. I liked this figure just because it was something different with “The other man in black” that has been overdone over the years.